FILE - A laptop shows part of a code, which is the component of Petya malware computer virus, according to representatives of Ukrainian cybersecurity firm ISSP, at the firm's office in Kyiv, Ukraine, July 4, 2017. It was a Friday in June, a short workday before a public holiday weekend in Ukraine, and cybersecurity expert Victor Zhora had left the capital, Kyiv, and was in the western city of Lviv when he got the first in a torrent of phone calls from frantic clients. His clients’ networks were being crippled by ransomware known as Petya, a malicious software that locks up infected computers and data. But this ransomware was a variant of an older one and wasn’t designed to extort money — the goal of the virus’ designers was massive disruption to Ukraine’s economy. “I decided not to switch on my computer and just used my phone and iPad as a precaution,” he said. “I didn’t want my laptop to be contaminated by the virus and to lose my data,” he said. Danish shipping giant A.P. Maersk-Moller, said that its cargo terminals and port operations were “now running close to normal again.” Hackers on June 27, 2017, caused widespread disruption across Europe, hitting Ukraine especially hard. The Petya virus, targeting Microsoft Windows-based systems, spread like wildfire across Europe and, to a lesser extent, America, affecting hundreds of large and small firms in France, Germany, Italy, Poland and Britain. While many Europeans saw the June cyberattack as just another wild disruption caused by anonymous hackers, it was identified quickly by experts, like the 37-year-old Zhora, as another targeted assault on Ukraine. Most likely launched by Russia, it was timed to infect the country’s networks on the eve of Ukraine’s Constitution Day. “Sometimes when targeting a particular government agency or official, they mount complex attacks, first using some disguising action, like a denial-of-service attack, and only then launch their main attack aiming, for example, at capturing data,” he said. Ukraine’s 360-member cyberpolice department was formed in 2015. The department is stretched, having not only to investigate cybercrime by nonstate actors but also, along with a counterpart unit in the state security agency, defend the country from cyberattacks by state actors. Demedyuk admits it is a cat-and-mouse game searching for viruses and Trojan horses that might have been planted months ago. FILE - Director of National Intelligence Dan Coats speaks during a Senate Intelligence Committee hearing about the Foreign Intelligence Surveillance Act, June 7, 2017, in Washington. “We have not experienced — yet — a catastrophic attack. But I think everyone in this room is aware of the ever-growing threat to our national security,” Coats added. And many of the digital weapons the West may face are being refined and developed by Russian-directed hackers in the cyberwar being waged against Ukraine, said Zhora and other cybersecurity experts. “They are using Ukraine as a testing laboratory,” said Zhora, a director of InfoSafe, a cybersecurity company that advises private sector clients and Ukrainian government agencies. Ukrainian President Petro Poroshenko speaks at a press conference in Tbilisi, Georgia, July 18, 2017. Since the 2014 ouster of pro-Russian President Viktor Yanukovych, Ukraine has been in the eye of a sustained and systematic digital storm of big and small cyberattacks with practically every sector of the country impacted, including media, finance, transportation, military, politics and energy. Sometimes, the intrusions are highly tailored; other times, more indiscriminate attacks like Petya are launched at Ukraine. Russian officials deny they are waging cyber warfare against Ukraine. Zhora, like many cybersecurity experts, acknowledges it is difficult, if not impossible most times, to trace cyberattacks back to their source. “Attribution is the most difficult thing. When you are dealing with professional hackers it is hard to track and to find real evidence of where it has come from,” he said. “But we know only one country is the likely culprit. 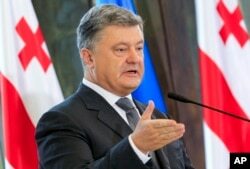 We only really have one enemy that wants to destroy Ukrainian democracy and independence,” he added. Ukraine’s cyberpolice head agrees. Demedyuk says his officers have been able to track attacks, especially denial-of-service intrusions, back to “Russian special services, tracking them to their own facilities and their own IP addresses.” But the original source of more complex intrusions, he said, are much harder to identify, with the hackers disguising themselves by using servers around the world, including in Asia and China. Security specialist Erik Dickmeyer works at a computer station with a cyber threat map displayed on a wall in front of him, May 20, 2015, in the Cyber Security Operations Center at AEP headquarters in Columbus, Ohio. Digital intrusions have seen data deleted and networks crippled with real life consequences. And digital weapons are being refined often with the knowledge gained from each intrusion. Zhora cites as an example of this evolution the difference between two large cyberattacks on the country’s electricity grid, the first in December 2015 and the second at the end of last year, which cut off energy to hundreds of thousands of people for several hours. With the first attack the hackers used malware to gain access to the networks and then shut the system down manually. “They sent an email and when someone opened it, the payload was downloaded and later it spread across the network and they used the path created for the hackers to get to the administrator’s work station and then in a live session switched off the subsystems overseeing electricity distribution,” he said. But with the 2016 attack no live session was necessary. “They used a malware which opened the doors automatically by decoding specific protocols and there was no human interaction. I think they got a lot of information in the first attack about the utility companies’ networks and they used the knowledge to write the malware for the second intrusion,” he said. 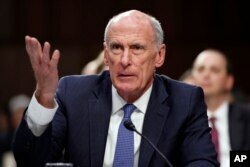 In his speech midweek in Washington, Coats specifically cited possible digital threats to America’s critical infrastructure, including electrical grids and other utilities, saying it is of rising concern. “It doesn’t take much effort to imagine the consequences of an attack that knocks out power in Boston in February or power in Phoenix in July,” he said. After the second cyberattack on Ukraine’s electrical grid, a group of American government and private sector energy officials was dispatched to Kyiv, where they spent a month exploring what happened, according to Ukrainian officials. One lesson the visitors drew was that it would be much harder in the U.S. to switch the grid back on after an intrusion. The Ukrainians were able to get the electricity moving again by visiting each substation and turning the system on again manually, an option apparently more challenging in the U.S., where grid systems are even more automated. 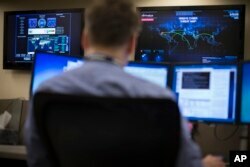 “Virtual attacks are every bit as dangerous as military ones — we are living on a battlefield,” Zhora said.